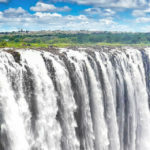 With our start in the magical Victorial Falls that offers a spectacular sight of awe-inspiring beauty and grandeur on the Zambezi River, forming the border between Zambia and Zimbabwe. Described by the Kololo tribe living in the area in the 1800’s as ‘Mosi-oa-Tunya’ which means ‘The Smoke that Thunders’. In more modern terms Victoria Falls is known as the greatest curtain of falling water in the world. To the precious Cape Town where we’ll find the Table Mountain and amazing Atlantis Ocean views. Experience the best of South Africa in a luxurious and unique way. Enjoy a cabled car riding to summit to the top of Table Mountain, step back in time and re-live the magic and majesty of another era at Selati Camp, and never miss the fun with safari activities or game drives, with the best of amenities and selected beverages. The internationally acclaimed Victoria Falls Hotel is set in acres of private gardens and was established in 1904. 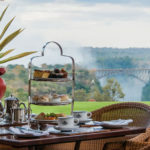 For over 90 years visiting members of Royal families, Heads of State, celebrities, authors, journalists and poets, have preferred to stay at the Victoria Falls Hotel where they are assured of total privacy, comfort and care. All rooms are well appointed, cool and comfortable – each room is air-conditioned, with every modern amenity. The beautifully appointed Edwardian swimming pool, surrounded by lush gardens and exotic trees, give total privacy. To visit Selati Camp is to travel back in time. Small, exclusive and brimming with history, colonial elegance and African legend, the camp is perched near the historic Selati Railway line after which it was named. Nights at Selati are quiet, intimate and possess a rare magic. Some say it is the hand of Selati’s namesake, the legendary female chief of the ancient Thubela tribe, others, the gentle glow of the lamps. Whatever it is, it has made Selati Camp an essential pilgrimage for romantic souls far and wide. Fashioned in the colonial, ‘Out of Africa’ style, Selati nestles under majestic Acacia Trees lining the Msuthlu River. 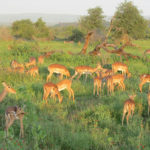 Situated between the Sabie and Sand Rivers, Selati lies on an animal migration path, with game traversing between the Kruger National Park and Sabi Sand Reserve. This daily search for water and food is an ancient rhythm and here it happens right around you as you sip your sundowner or wake to a dawn chorus of hundreds of bushveld birds. Earth Lodge is a sanctuary. Uniquely so, as it is for both humans and animals. For the former it is a retreat to the wilderness. For the latter, part of a vast conservation known as Sabi Private Game Reserve. The lodge’s organic architecture is completely respectful of the environment. Whilst submerged in nature, its size and form never intrude on its magnificent host. The entire lodge features an unusual, unadorned finish that has been achieved by blending natural elements such as straw, stone and pigment into the cement plaster. The natural bush vegetation that grows right up to the lodge building further enhances this natural feel. The style of the unique architecture was inspired by ‘Earth Shelter Architecture’ from the Middle Ages, where the buildings are excavated into the slopes of the site, and the sand and plants are put back onto the roofs. The result is what has been termed by a visiting conservationist ‘the most ecologically-sensitively-designed lodge in Africa’. The buildings merge so well into the landscape, they are virtually invisible. It is this respect for the land that Earth Lodge’s culture imparts to its guests. Along with its legendary Sabi Sabi Big Five safaris, the lodge’s purpose is to let nothing stand in your way in re-kindling your bonds with earth. Light aircraft transfer Maun Airport to the lodge. National Park fees and all government levies and taxes. 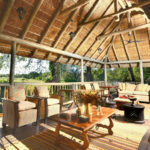 An elegant, elevated thatch structure serves as the main building, comprising the main sitting area, wildlife reference library, dining room and cocktail bar, inviting a true sense of the African wilderness. Other facilities include a swimming pool with sundeck and thatched boma where brunch and high tea are served. Accommodating just 24 guests in newly refurbished African-style safari tents, each individually sited on a raised teak platform with private en-suite facilities and viewing deck, most offering unsurpassed views of the Xakanaxa lagoon. 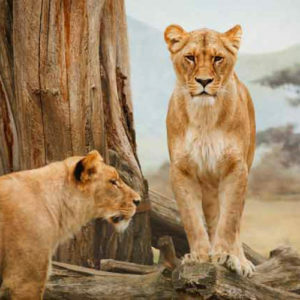 Game drives in open 4×4 vehicles, both in the morning and afternoon, offer frequent sightings of lion, leopard, cheetah, elephant, buffalo and a variety of the animal, bird and plant species which inhabit the area. Alternatively, guests can explore the Xakanaxa Lagoon and surrounding Okavango Delta channels by motorboat. Light aircraft seat-in charter transfers as stated. Please note that luggage is limited to 20 kg soft bags, including hand luggage. Accommodation in Suites with inclusions as stated in the itinerary. – Transfers and touring by air-conditioned vehicles. – Entrance fees for touring as per itinerary. – Park fees during Vic Falls excursions. – Sunset canapes and welcome drink at De Grendel Estate on 28 November. – Other drinks at the estate will be for own account. – All expenses of a personal nature, such as telephone calls, purchases, etc. – Meals other than stated under inclusions. – Gratuities (tips) to drivers, guides, game rangers and lodge staff. – All other services not stipulated above. Staying at Selati Camp with morning and afternoon Game Drives, optional Walking Safaris after breakfast, pampered with snacks and selected Beverages. Last day at Selati Camp with Morning and Afternoon Game Drives, optional walking Safaris after Breakfast, snacks and selected Beverages. Laundry Service Available. Early evening transfer to Green Point for inter-active drumming and set menu dinner with entertainment at the Gold Restaurant. 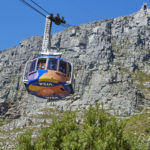 Full day tour(including dinner) of the Cape Winelands. The winelands tour will focus on the wine producing areas of Stellenbosch and Franschhoek. Two wine tastings will be included during the day and they will be at intimate wine estates. The day will also include watching the duck run at Vergenoegd Wine Estate. Picnic lunch will be served at Warwick Estate. We’ll provide you with some time in Franschhoek’s main road for those wishing to browse a bit, before travelling to the award-winning wine estate of De Grendel. A selection of canapes and sundowners will be served, flowing into 3-course Thanksgiving Dinner. Departure back to the hotel will be around 21h30. Check full Including package in Trip Details Tab.